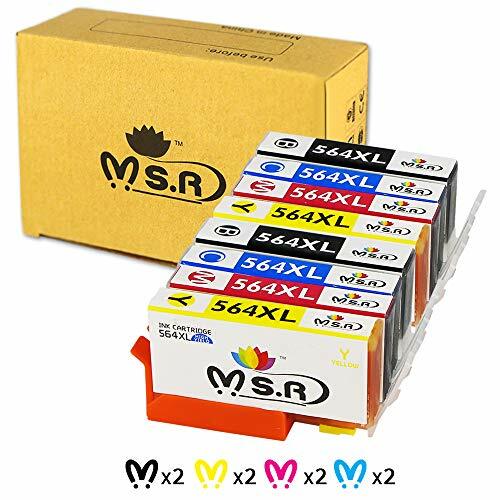 Color:2*BK/C/M/Y Cartridge Code:564XL Compatibility: 4 Color Printer (Not Include Photo Black) Hp photosmart 5510 5512 5514 5515 5520 5525 6510 6512 6515 6520 6525 7520 7525 B209a B210a B210e officejet 4610 4620 4622 deskjet 3070a 3520 3521 3522 3526 5 Color Printer (Include Photo Black) Hp photosmart 7510 7515 B8550 C309g C309n C310a C410a C510a C6340 C6350 D7560 About Our Product: Advanced Chip: Complex technology brings complete compatibility. Quality Control: 100% post printing test for each cartridge. High Yield & Great Quality: High ink capacity for more printing pages. Easy installation and recognized instantly by printers. Print with excellent color and crisp text. Safety Certification & Warranty: All our cartridges are certified and have quality marks (MSDS, IS09001). We also provide friendly customer support and money-back-guarantee for 1 year. Note: Please make sure your printer model. Please remove the cap, do not need to remove other tabs. Please avoid touching the chips. If you have any issues or concerns, please contact us.